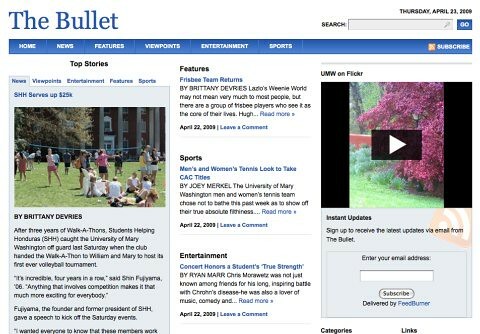 You can’t keep the best damn educational blogging platform from Timbuktu to Portland Maine (or Portland Oregon, for that matter) down, and here’s the proof: UMW’s student-run newspaper The Bullet is now running it’s web-based version on UMW Blogs! (Notice the mapped domain, my new obsession.) It took a while, but when the ball got rolling it was surprisingly quick. They moved over to their modest new digs for the last run of this school year, and they plan on spending the Summer re-imagining and re-designing the site as they settle into the easy living and expansive comfort of WordPress. I can’t begin to tell you how excited I am about this, and a huge shout out to Mike McCarthy, a visiting professor of Journalism, who made this all happen (he’s 24 karat gold! ), as well as Aaron Richardson who will be the new web-editor for the Bullet—a cat I imagine will have had more than enough of me by Summer’s end. And, as an added bonus, Claudia Emerson’s Literary Journals course had an article in this week’s paper highlighting the students’ journals, and the title is nothing less than “Students Tweet for Class Credit.” And while the headline is a bit misleading, it’s about time the amazing work by the faculty and students at UMW got a little love from the school paper. Nobody can stop UMW Blogs, baby, NOBODY! This entry was posted in UMW Blogs and tagged blogging, claudia emerson, literary journals, newspaper, the Bullet, UMW Blogs, WordPress. Bookmark the permalink. Looks so much better! 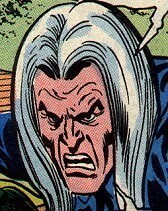 Well done, and I’m glad to see the bullet getting a web presence that isn’t pitiful! Great job on the site! I was always so disappointed with the bullet site before- you couldn’t even search the archives, and the ads and spam were nasty. What a great makeover!